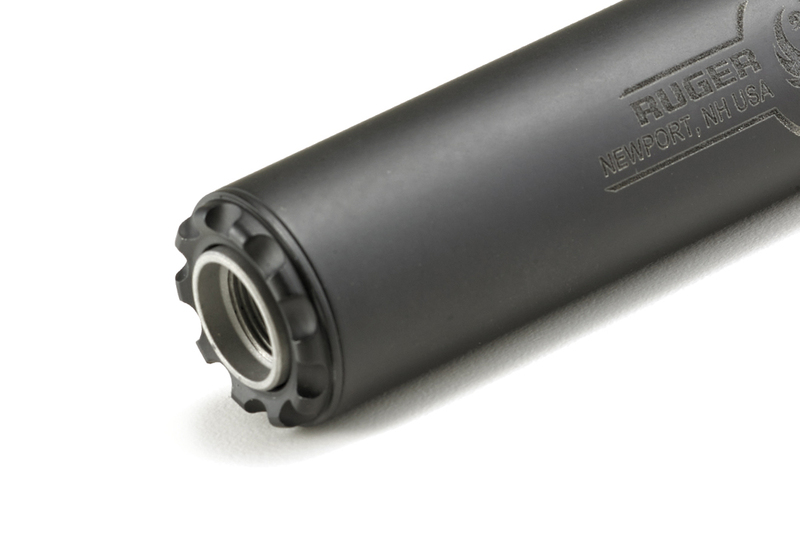 Ruger® Silent-SR®, A .22 LR Suppressor designed and built by Ruger. 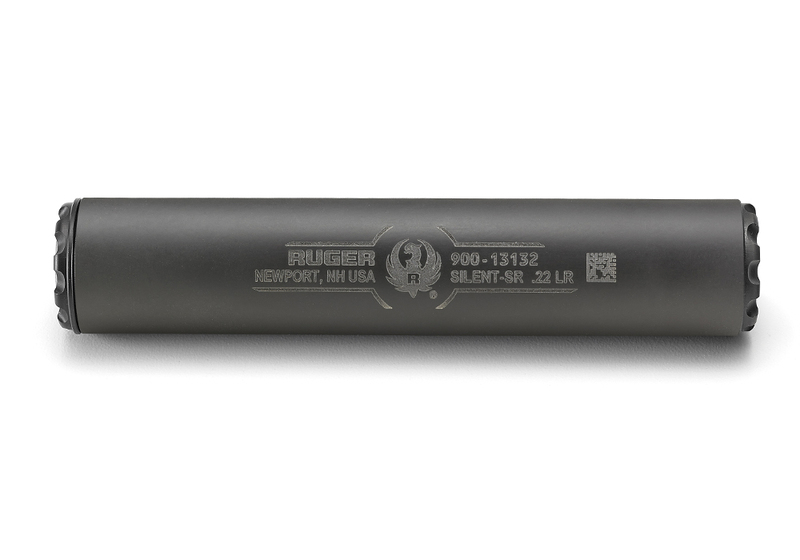 The Ruger® Silent-SR® sound suppressor features best-in-class materials and advanced design, resulting in a lightweight, compact size and top-tier sound reduction. It was designed and built by Ruger utilizing the very latest in fluid dynamic simulation and computer numeric controlled (CNC) machining equipment. 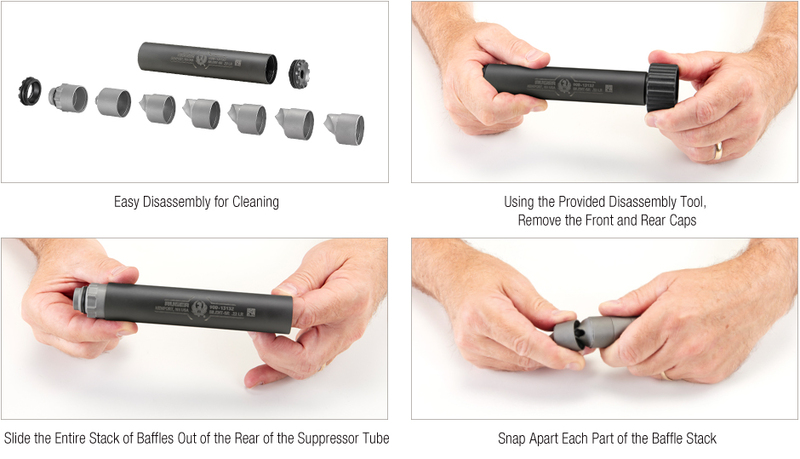 The Ruger® Silent-SR® is easy to disassemble and clean. 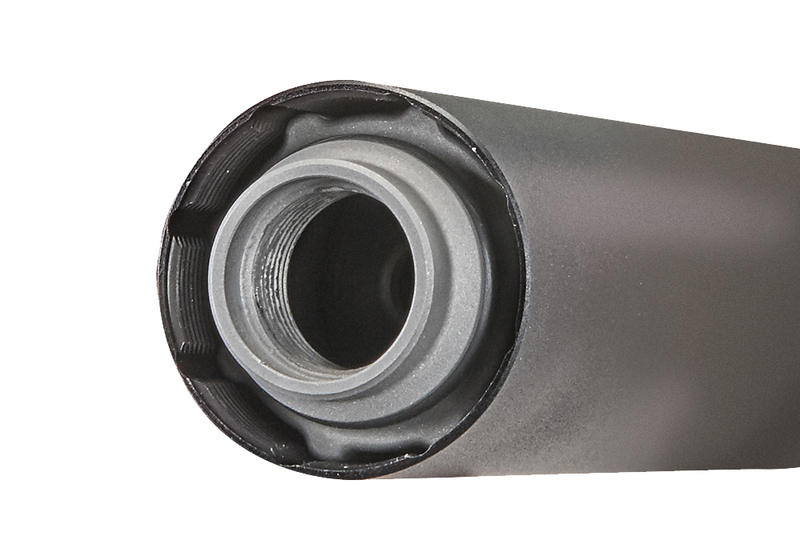 Each piece snaps together to seal the baffles and keep the byproducts of combustion away from the tube and end caps. It is also strong and light, utilizing a titanium tube, aluminum rear cap, and stainless steel threaded mount, baffles and front cap. Ruger has selected the best material for each part to maximize strength and minimize weight without sacrificing durability. 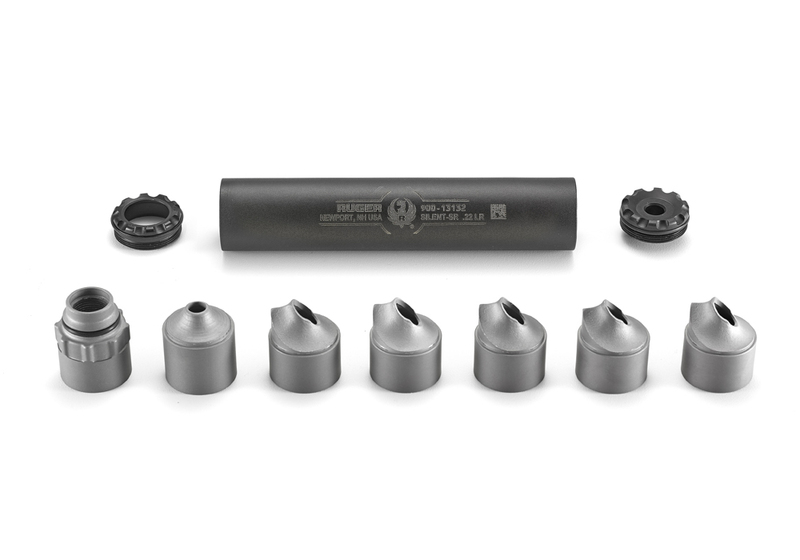 Reduces sound pressure levels of .22 LR, .22 WMR and .17 HMR pistols and rifles by up to 40 dB. Rated for .22 LR full auto, .22 WMR, .17 HMR and 5.7x28mm pistols and rifles. 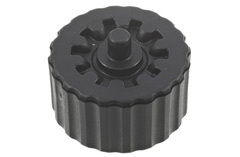 Features a standard 1/2"-28 thread pattern for compatibility with most threaded rimfire firearms. Patent-pending outer tube and muzzle mount are interlocked to prevent accidental disassembly when removing the suppressor from your firearm. Disassembly tool is included. With a 5.37"13.6 cm length, 1.06"2.6 cm diameter and 6.3 oz178.6 g weight, the Silent-SR® is compact and lightweight for balance and portability. 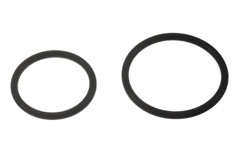 Easy to disassemble and clean, each piece snaps together to seal the baffles and keep the byproducts of combustion away from the tube and end caps. Utilizing a titanium tube, aluminum rear cap, and stainless steel threaded mount, baffles and front cap, Ruger has selected the best material for each part to maximize strength and minimize weight without sacrificing durability. Where can I purchase a Silent-SR®? You may purchase a Silent-SR® at your local Ruger® retailer who deals in items regulated under the National Firearms Act ("NFA"). Please note that not all retailers deal in NFA-regulated items. What is required to purchase a Silent-SR® (How do I do it)? In order to purchase a Silent-SR® from your retailer, you must be at least 21 years of age, a resident of the United States residing in a state that allows civilian ownership of suppressors, and be legally eligible to purchase a firearm. The American Suppressor Association often has information about state-by-state suppressor laws Learn More. You should always independently verify the accuracy of the information you find online. To purchase your Silent-SR®, you must submit all or some of the following Forms and information to ATF, depending upon your method of purchase: ATF Form 4 (in duplicate); a check or money order in the amount of $200 for the transfer tax; and either passport photos and fingerprints (if you are purchasing as an individual), or trust documents or LLC articles of incorporation (if you are purchasing the suppressor through a trust or LLC). Once ATF has approved your Form 4 and returned it to your local retailer, your retailer can transfer the Silent-SR® to you. Please note that there is frequently a significant delay (typically, several months) associated with the approval of a Form 4. ATF publishes a list of current wait times, which is updated quarterly and is available here. How do I complete a Form 4? The Form is available here. Instructions are included with the Form. Additional information about items regulated by the National Firearms Act is available from ATF here. How long will it take for my Form 4 to be approved by ATF? ATF publishes a list of current wait times, which is updated quarterly and is available here. There is typically a wait time of several months. Can I send my Silent-SR® to Ruger for service or repair? Yes. Please contact Customer Service at 336-949-5200 and someone can help you. 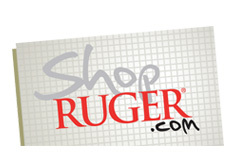 How do I ship my Silent-SR® to Ruger for service or repair? Please contact Customer Service at 336-949-5200 and someone can help you. Do I need an ATF Form 5 to ship my Silent-SR® to Ruger for service or repair? No. There is no need for you to complete and file an ATF Form 5 for repairs. If my Silent-SR® is damaged beyond repair, can Ruger replace it for me? Yes. Be advised however that, in addition to any charges associated with the new Silent-SR®, replacement will require completion of a new Form 4 and payment of an additional $200 transfer tax. 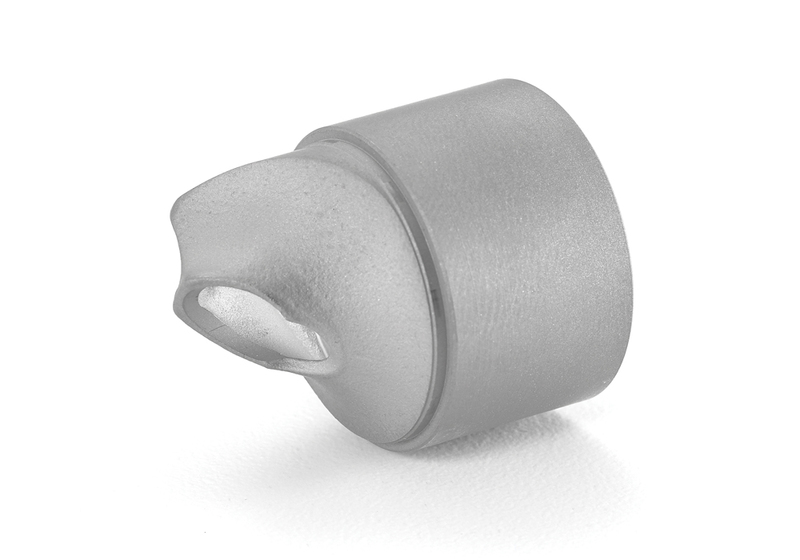 What laws regulate the use of my Silent-SR®? Federally, suppressors are regulated under both the National Firearms Act and the Gun Control Act (https://www.atf.gov/file/58686/download). 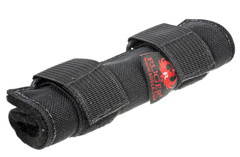 Various state and local laws also regulate the use or possession of suppressors. Please be sure that you fully understand whether you may own a suppressor in your state, and for what uses it is allowed, before you use your Silent-SR®. Do I need to register my Silent-SR® with the government? Yes; federal law prohibits taking possession of a suppressor that is not registered to you or to a trust or LLC of which you are a member. (This is the purpose of the Form 4.) Your state or local government may also require additional registration. Can I loan my Silent-SR® to a friend or family member? No, you may not. Because the suppressor is registered only to you, you may not loan it to anyone else. The National Firearms Act prohibits unapproved transfers, including loans, even to family members or spouses. Can I hunt with my Silent-SR®? Certain states allow hunting with suppressors. We recommend researching your local hunting regulations. The American Suppressor Association (http://americansuppressorassociation.com/education/) often has information about state-by-state suppressor laws. You should always independently verify the accuracy of the information you find online. Can I use my Silent-SR® at my local gun range? Generally, if you legally own a suppressor, you may use it at your local range. However, your range may have rules prohibiting the use of suppressors. We recommend contacting your local range with any questions. Should I take precautions when traveling or driving with my Silent-SR®? Your state may regulate the intrastate transportation of suppressors. As to interstate transportation, federal law provides that, subject to state and local laws and regulations, if you are legally entitled to possess the Silent-SR®, you may travel with it in your car between two locations in which you may legally possess it if, during such transportation, neither the Silent-SR® nor any ammunition being transported is readily accessible from the passenger compartment of the vehicle. In the case of a vehicle without a compartment separate from the driver's compartment, the Silent-SR® should be contained in a locked container other than the glove compartment or console.